After hammering on Apple's external GPU developer's kit for a week, AppleInsider discusses the hardware, the technology, and what needs to happen in the future for adoption of the concept by Mac users. There are a few key points we just want to get out of the way, up front. Yes, the Sonnet eGFX Breakaway Box 350 at the core of the developer's kit runs on Sierra —with relatively simple hacks required to get it going. No, the AMD RX 580 video card in he kit doesn't. Yes, we did benchmarks. No, they're not really relevant, believe it or not. Thunderbolt 3 will hit you for about 10 percent of any given card's maximum potential performance-wise. Connecting through Apple's $59 bi-directional Thunderbolt 3 to Thunderbolt 2 adapter, Thunderbolt 2 will chop off about 20 percent, and Thunderbolt 1 will kill nearly 50 percent. Don't loop back the video to a MacBook Pro's display with hacks you find, because that's about another 50 percent, in addition to the overhead from Thunderbolt. Yes, that means you get almost nothing out of a Thunderbolt 1 system looping back. Plus, there's no good way to compare Metal to Metal 2 in High Sierra today. The AMD card in the developer's kit doesn't work in Sierra, and the Nvidia cards we're using in Sierra don't work in High Sierra right now. That out of the way, let's look at the AMD RX 580 card, the enclosure, and how this all works with macOS. 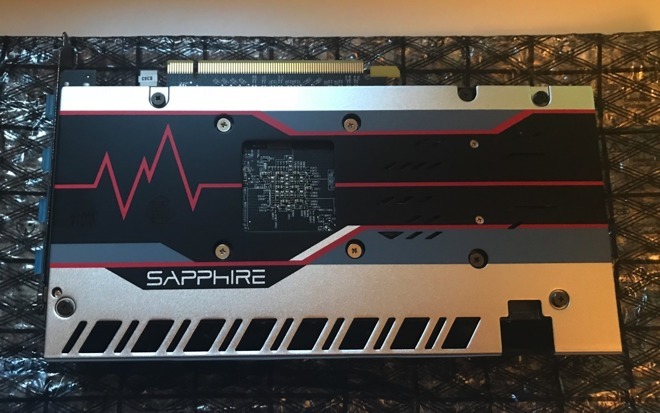 The RX 580 card included in the developer's kit is as expected, a reference-design card from Sapphire. Roughly speaking, outside of an enclosure, it is a 6 tflop card, where there the Radeon Pro 460 and 560 built in to the 2016 and 2017 MacBook Pros respectively are right around 1.9 tflop as installed. So, the RX 580 delivers about triple the raw computing power of the discrete GPU. The enclosure is an unmodified $299 Sonnet eGFX Breakaway Box 350, which isn't shipping outside of this developer's kit until late June. A $349 version will be available for cards that need more power in July. The Sonnet box is quieter using the same cards than all of the other enclosures we've tested. Fully stressed, the enclosure hit 51 dBA at three feet from the case, versus 71 on the Razer Core and 64 dBA on the PowerColor Devil Box. Idle, the Sonnet enclosure is 40 dBA, with the the Devil Box peaking at 44dBA, and the Razer Core maxing out at 49dBA. As an added bonus, the tidal volume of air ripping through the Sonnet enclosure is less, with the case utterly lacking the ability to move a box of Kleenex, like the Razer Core did. For comparison, A 2016 MacBook Pro under load is about 36dBA and about 31dBA idle or under light load. During the course of our testing, we connected the Sonnet eGFX Breakaway Box 350 connected to a Acer CB281HK 4K display by DisplayPort downstream of a series of Thunderbolt 3 docks, and still had no performance issues or bandwidth limitations on it, even when assaulting the dock with network and mass storage calls. Performance dipped a very little bit with a second Acer B286HK 4K display attached to the dock. If this is a use-case you're considering, plug in the 4K display not to a dock in-line with the eGPU, but to the computer directly —all performance hits evaporate on a 15-inch 2016 MacBook Pro. The enclosure delivered 60W of charging power. This isn't enough for the 15-inch MacBook Pro now, as clamshell mode isn't available at present. The beefier Sonnet enclosure for higher-powered cards rectifies that situation and provides full power —but isn't an option for the developer's kit. Once again, as is the case with nearly every Thunderbolt peripheral we've tested, the included cable is about 18 inches long, and near useless, given that the port on the dock is on the rear of the case. Count on $50 or more on top of the kit's or enclosure's price to get a usable length active cable, capable of full data transfer speeds. Power demands aren't small. If you're used to your laptop sipping at power while cranking away at your work, the extra 300W plus that you're sucking down might make an impact. That, and consider ventilation issues. 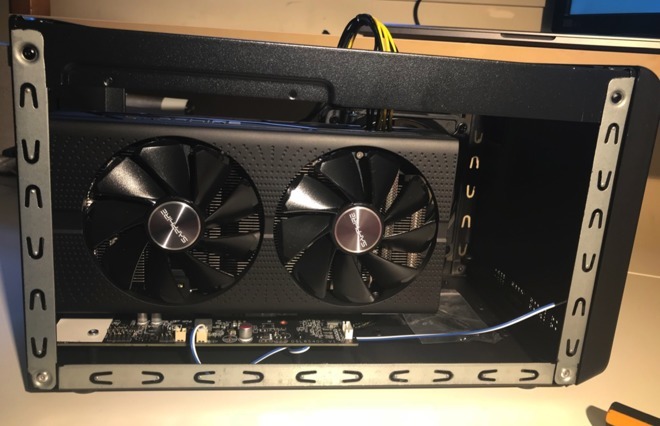 While we already mentioned that it isn't moving a high volume of air, it does need to be vented and the air coming out of the case is pretty warm. On the other hand, if you're used to the slab-side Mac Pro tower, then power or ventilation issues from the enclosure aren't a big deal. Without relying on third-party hacks, Apple's eGPU implementation in High Sierra is very much in its infancy. There are a bunch of restrictions, including the aforementioned lack of clamshell mode, no current support for HDMI audio, no sleep support for the attached Mac, and a few other things. These might be a big deal for you, they might not. The restrictions are more-or-less universal to both the third parties, and Apple's use of the technology. We'd like to see Apple eliminate some of them in the build-up to a spring 2018 release for the general public, but we're not sure what Apple's plans are for actual user support, and supported technologies. What we don't want to see is anointed case and card combinations. 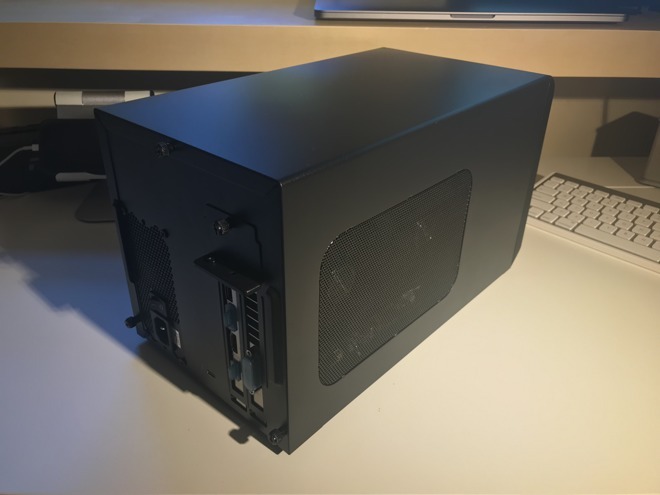 An open case that adheres to the Thunderbolt 3 protocol, and a wide selection of compatible video cards to choose from will help the daring users who want to give it a shot. That way, the Final Cut Pro crowd can get the optimized AMD cards, and the Adobe gang can get Nvidia, and everybody can live happily in an environment optimized for what they need. But, a burly video card regardless of manufacturer is still faster than the Radeon Pro discrete chipset included in the MacBook Pro, even if not optimized. We feel that support of clamshell mode is a must for the release. 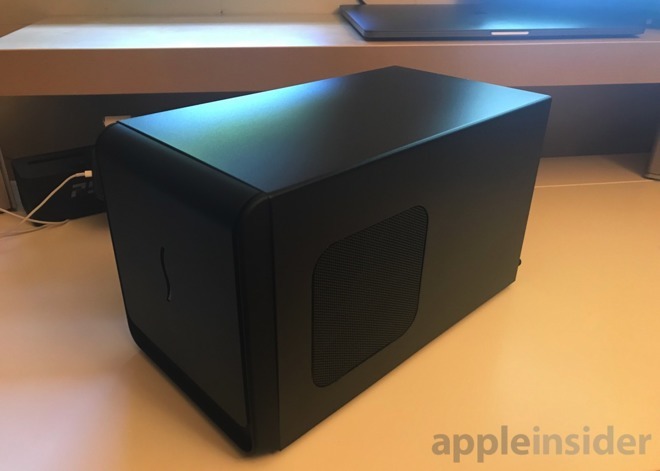 While we're dreaming we'd also like to see Apple play around with the technology a little before release, and allow cases with a pair of Thunderbolt 3 ports, like the Devil Box, be able to pass the accelerated signal back to a connected MacBook Pro, or iMac, or use two ports for a SLI case holding two beefy cards operating in tandem to drive an external monitor. But what you get is what you get. We know that Apple reads AppleInsider, but we just don't know how much they listen.